1. Preheat the oven to 350°F. Adjust oven rack to middle position. Grease and flour two 9-inch round pans. 2. Whisk together flour, baking powder, baking soda, cinnamon, nutmeg, cloves, and salt in large bowl; set aside. In a food processor fitted with large or fine shredding disk, shred carrots (you should have about 3 cups); transfer carrots to bowl and set aside. You can also shred by hand on a box grater if you don't have a food processor. 3. In the bowl of a standing mixer fitted with paddle attachment (or in large bowl and using hand-held mixer), beat sugars and eggs on medium-high until thoroughly combined, about 45 seconds. Reduce speed to medium; with mixer running, add oil in slow, steady stream, being careful to pour oil against inside of bowl to prevent splattering. Increase speed to high and mix until mixture is light in color and emulsified, about 45 seconds to 1 minute. Turn off mixer and stir in carrots and dry ingredients by hand until incorporated and no streaks of flour remain. 4. Pour into prepared pan(s) and bake until toothpick or skewer inserted into center of cake comes out clean, about 32 minutes for 9-inch round pans and 40 minutes for a 9X13-inch pan. Let cakes cool for about 10 minutes in the pan and then invert them onto a cooling rack to cool completely (the 9X13-inch cake can be cooled completely in the pan if you don't plan to invert and ice all the sides). 5. When cake is cool, mix cream cheese, butter, sour cream, and vanilla at medium high speed in clean bowl of standing mixer fitted with whisk attachment (or in large bowl using handheld mixer) until well combined, about 30 seconds, scraping down bowl with rubber spatula as needed. Add confectioners’ sugar and mix until very fluffy, about 1 minute. 6. If you have a cake level, remove the rounded tops of both cakes, so the surfaces are flat. This step is optional, but having the bottom layer flat makes it slightly easier to stack another layer on top of it. If you don't have a level, you can use a serrated knife. 7. Place bottom layer on a cake stand (or plate) and apply a medium layer of frosting. Place the second cake on top, apply enough frosting to cover both cakes in a thick layer. 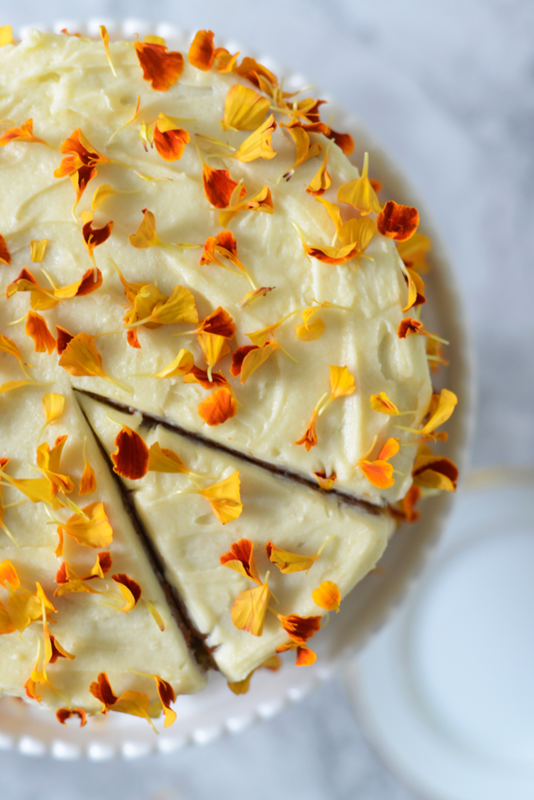 Sprinkle flower petals on top and serve!